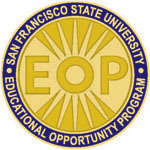 For 50 years, the Educational Opportunity Program (EOP) at SF State University has improved access and retention of historically underserved (low income, first generation college) students by facilitating their matriculation into SF State and by providing a support system for their success. EOP is a comprehensive program designed to provide students with outreach, admissions, academic, and financial support. Students receive on-going advising, tutoring, and workshops designed to increase retention and graduation rates. Eligible EOP students are encouraged to apply to additional EOP programs such as Summer Bridge - an eight-week intensive academic early start summer program, Guardian Scholars Program - a comprehensive program that serves former foster care youth, and Student Support Services - a federally funded TRiO program that provides intensive academic support for students in their first two years of college. To apply to EOP for the 2019-2020 academic year, please complete the EOP supplemental questions and both letters of recommendation included in the Cal State Apply application at https://www2.calstate.edu/apply by January 31, 2019. Register for EOP Workshops Online at Eventbrite.